Film and television audiences and readers of spy thrillers in the 1960s and 1970s were thrilled by the perilous life of David Callan, reluctant employee of the ruthless British intelligence agency known as ‘The Section’. Involving covert operations, blackmail, frame-ups and brutal executions, with British spies who were as callous as their Soviet opponents, the Callan franchise was dark and uncompromising, poles apart from the glamorous exotica of James Bond and The Avengers. Created by James Mitchell, the Callan TV series ran for four years and is still highly regarded over forty years later. The lead actor, Edward Woodward, became a household name and went on to appear in The Wicker Man and The Equalizer. 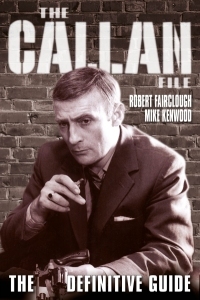 The Callan File features interviews with cast, crew and writers, many offering fresh insights into Woodward’s early career and telling the story of Callan both on screen and off. As well as new interviews with (among many others) actors Patrick Mower, Peter Egan, Hugh Walters, Julian Glover and Kenneth Gilbert, writers Robert Banks Stewart and Trevor Preston, directors Piers Haggard and Mike Vardy, the authors have also been able to use archive interviews with James Mitchell, Edward Woodward, Russell Hunter, Anthony Valentine, William Squire, Clifford Rose, Terence Feely, Ray Jenkins, Bill Craig, Peter Duguid and Shaun O’Riordan. The book includes a foreword by James Mitchell’s son Peter and an afterword by Spooks: The Greater Good director Bharat Nalluri. Covering all aspects of Callan on film and TV, in novels, short stories and on radio, this book is the only guide you’ll ever need. Produced with the full co-operation and support of James Mitchell’s family, with exclusive access to their Callan archives.